At SignWorld, our main goal is to outfit businesses with engaging and appealing signs that help them attract more business. We make this possible for all of our customers, no matter what their specific signage budget and needs may be. In this endeavor, foam-based signs are particularly useful. Not only is our range of foam-based material inexpensive, but it makes for excellent signage, storefront displays, and visual aids for presentations, too. 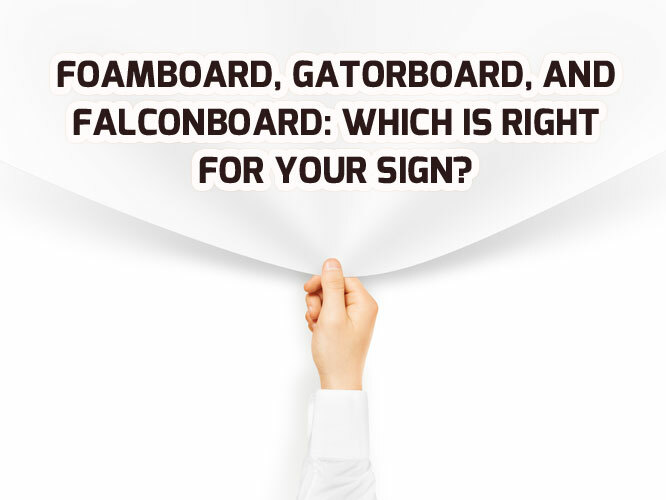 We have a number of options for foam-based signage, including falconboard, foam board – also known as foam core – and gatorboard, which is referred to sometimes as “gatorfoam.” All of these materials are foam-based, but distinct differences do exist. In this post, we discuss some of them, and explain how they stack up next to one another. Read on to learn what’s best for your business, courtesy of the SignWorld team! Foam board is an extremely common option, which could in itself be enough to influence your decision. If you want something tried and true, foam board is a pretty safe option. It’s made up of lightweight, rigid foam that is pinched between two white paper faces. Your custom design is printed in full color on the front, and built to last with fade and abrasion-resistant UV ink. You get a high-quality matte finish on a sign that is relatively cheap, durable, and extremely lightweight at about 0.13 pounds per square inch. Foam board is suitable for personal and professional applications, and it’s cheap enough to be warranted for a one-time event or promotion. The cheap and lightweight nature of foam board also makes it an excellent option for situations where multiple signs are needed for directions or displays. The board is slightly pliable, but extreme wind conditions could crease or snap the board, so keep this in mind when mounting your foam board sign. Gator board is a more durable variant on traditional foam board signage. Gator board is made of a rigid foam core that contains a dense compound called polystyrene. Despite being stronger, gator board does not weigh much more than traditional foam board. Gator board does have some water resistant properties in its ink and polystyrene core, but it’s nothing like its amphibious namesake, so keep it dry as much as possible! If handled properly and not exposed to moisture, gator board can easily last 2 years or more. You will have to pay slightly more for a gator board sign, but the durability is often worth it. Falconboard is made by sandwiching a honeycomb paper core between two white paper faces. The core is similar to dense cardboard in weight, rigidity, and appearance, giving your sign stiff, strong, and lightweight characteristics. Compared to foam board and gatorboard, falconboard is extremely resistant to bending and snapping. Falconboard has a kind of 3D appearance, which can open up a whole new world of possibilities for sign and display design. Falconboard is also a great choice for the eco-friendly business owners among us, as it is 100% biodegradable and made entirely of renewable materials. Still have questions about sign design and material options? You can learn more about our signage materials, or schedule a consultation with our team today by visiting https://signworld.org/.